Welcome to Something About Coins! Below are articles covering recent coin news. 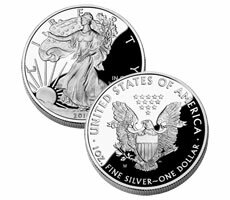 The U.S. Mint removed all restrictions on the 2011 Proof Silver Eagles and announced their next coin ceremonies for upcoming quarter-dollars. U.S. cents led last month's coin production, as the Mint ramped up their overall output. The trial is underway to determine who owns the ten 1933 $20 Gold Double Eagle coins. The Royal Canadian Mint added a new design to their twenty-five cent pieces, and a rare Roman coin will be auctioned in September. Enjoy!